All the attendant adjustments to the complete change in environment my move to Portland entails have activated what I call “52 pick up.” It means that every orientation point my nervous system has habitually relied on is getting rearranged and so all orientation points are almost literally “up in the air.” This makes for a lot of confusion in executing the most basic transactions, such as finding my glasses while in the store, paying for groceries, going to the post office, etc. Slowly, over the last several months, life is gradually getting more grounded. Thankfully, what I fondly refer to as my “Mrs. Magoo Aspect,” also kicks in. She is delighted by everything around her, ping ponging around to admire each thing that catches her eye, while all the while making missteps, mistakes, and blunders. But she doesn’t seem to mind. In fact, they make her giggle, and they don’t dampen her enthusiasm in the least. One of the activities I’ve tried to keep going as a “grounding” force since the moment I moved in is my love of tending a garden, or at least helping things grow in it. I immediately fell in love with the Emerson Street Garden down the block, and volunteered to water at Bakari Garden, a few blocks away, so I could participate in the Urban Farm Collective Farmer’s Market each Monday evening. I am also blessed with the sweetest little patio in my small complex, at least to my way of thinking. The woman who lived here before me landscaped it with lovely, easy to take care of flowering plants like hellebore (Lenten Rose), and beautiful honey suckle vine climbing up a trellis, some bamboo and a graceful feathery evergreen tree. The flagstones are lined with moss and small green ground cover, and it is, in short, a delightful place to be. The room for plants was almost non-existent in the u-haul my son and his friends packed my belongings in, but somehow I managed to bring a pot of portulaca and some tomatoes grown from my friend Eric’s heirloom seeds. (I had about 8 of them by November and saved a few seeds from those, too.) I carefully placed the few things I managed to bring and hoped, with the longer growing season, that I might get to have some fall greens. Everything came up, but lo and behold, that is how I discovered that I share my patio with huge snails and slugs. They ate absolutely everything green thing I started. Then I read somewhere they don’t like copper, so I started lining the dirt in my pots with pennies. I also did this in a small space of dirt I cleared along the back fence behind our parking lot, where blackberries have mostly taken over, but where a woman who once lived here obviously had created a two tiered garden. There is even a peach tree and a cherry tree. Unlike the gardens in my neighborhood that immediately caught my eye, only gradually did I see the garden that was once flourishing literally right in my own backyard. The pennies did the trick keeping the snails at bay, but by then it was cold and winter had set in. The few starts I managed to get in pretty much stopped growing and when it got warmer a month or so ago, they have started to go to seed. But that’s fine with me. Next Spring I will have LOTS of arugula in the first bed, and, I hope, by then, more, in have more space I have slowly cleared. I am also a bit of a guerilla gardener. I like to sneak things in where I hope they might grow. My condo mates have various planters outside their respective patios, but no one is growing much of anything in them. Back in February I couldn’t resist planting some early Alaskan green pea variety I had left over all around the cute little cherub you see at the top of this post, which I later found out was a gift to my next door neighbor from her mother. But my Mrs. Maggo aspect forgot all about them. Not far from this cherub, there is a wooden planter directly under a trellis. I discovered the planter was completely empty, and that the vine growing out of a barrel container next to it took up only part of the trellis. Slowly, each day, I would add dirt to the planter until it was full. Mike took me to Fred Meyer to get enough organic soil to top it off and there I picked out some Sugar Snap Peas. I soaked them over night and the next day in the off-and-on drizzle, I labored to somehow afix copper tape to the edge of the planter and weight it down with pennies and small rocks. 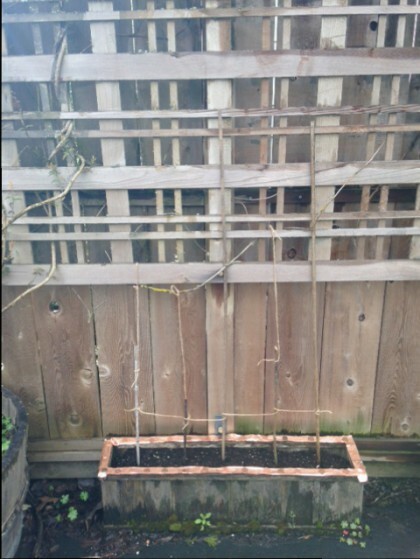 I built a trellis to the trellis with sticks and hemp cord, and I planted the peas. This process entailed a lot of muttering to the copper tape, and the snails that might be watching, and the wind that I prayed would not blow everything down. 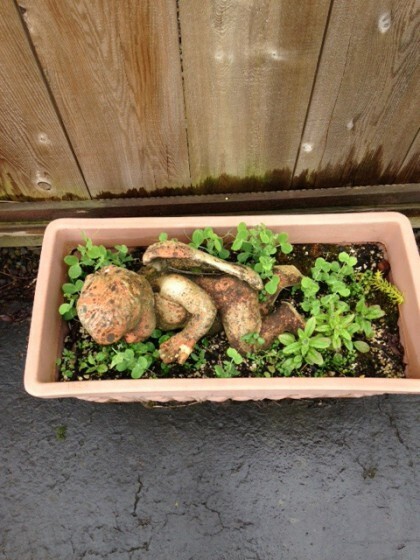 In the middle of one of those mutters, I looked up and over, and my eye caught the planter with the cherub in it. Were those PEAS in there? And then I couldn’t stop giggling. Not only were they peas, it took me a while to remember they were peas I had actually planted and they had somehow come up amidst the snail population and without copper pennies to guard them. My neighbor seemed happy enough to see them sprouting around her cherub, and I took it as a good sign for the future my sugar snap peas. Muttering and then giggling, that’s how I spent my first day of Spring. Resurrecting the former garden beds from the blackberry bramble is a, well, thorny process. But as you may recall from my post Elegy for the Blackberry Bramble, I have some experience with blackberries. So any time weather permits and I have energy, I try to make a little headway, coaxing them to share the space wtih me. In that process I discovered a huge rhubarb plant, from which I have made some easy and pretty healthy vegan rhubarb crumble. Perhaps I’ll share that recipe soon. There’s also a giant artichoke plant, and comfrey coming back up. (Good for when Mrs. Magoo trips and falls or runs her toe into the couch.) All this bounty has started up a curiosity in me about the woman who did all this before me, and gratitude that there is a treasure trove of a garden underneath the bramble because of her efforts. Buoyed by the sprouting peas and the success of my make shift trellis (so far), I turned my attention to a barrel planter on the outside of the fence of my other next door neighbor. She is a young woman busy with work and school and when asked, she said, oh go ahead, plant whatever you want. I had designs to put some nasturtium and basil seeds together in it, but first some weeds and what looked like quack grass to me from a distance had to be pulled out. 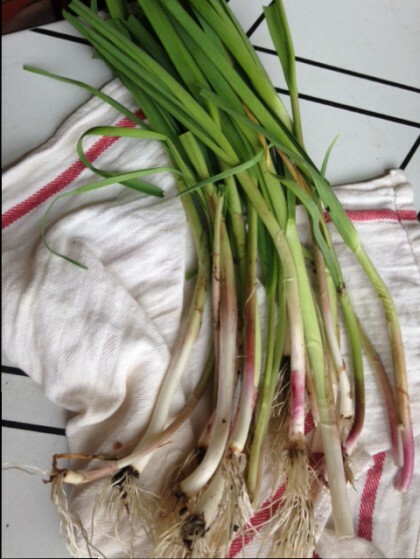 Imagine my surprise when I went to pull the first handful out of the planter and found, not quack grass, but green onions! Not since years ago when my neighbor down the alley from my Asbury Street house thinned his green onions and gave me what he was only going to throw away have I been in such serendipitous bliss of green onion plenty. I LOVE green onions, and I LOVE not having to buy them at the store. . .
For a moment I worried that someone else may have planted them and would come looking, but then I realized that was not likely at all. Instead I ascribed them mysteriously to the phantom woman gardener who came before me. I ate a couple just by themselves and chopped some up on my stir fry for dinner. I put the green ends in the freezer with my kale stems, carrot ends and squash seeds to make broth with. And when I talked to my dear friend on the phone for our full moon phone call, I told her this woman must have planted the onions and that I had found them. My son has started a tradition of video taping me a hilarious good morning, which he sends on FB each day. Today he had also asked me how my Wednesday went. So I started to tell him about the discovery of the onions. And as I typed, I realized, all of a sudden, that I was the one, desperate last fall to be able to plant something, anything, to make me feel grounded, who had dumped a packet of old green onions seed into that barrel. I am the phantom gardener I have been thanking of the last 24 hours. All this morning I laughed out loud every time I thought of it. I think my Mrs. Magoo Aspect should get an award for this one. And, in a way, she has: these beautiful green onions, which I could barely ever get to grow in the dry Palouse climate. Welcome home, Mrs. Magoo. You have arrived in Portland, where they like to keep things weird, and where you can dump a packet of old seeds in a planter and have onions in a few months, whether you remember you planted them or not. An Angel pea’d in the planter. Hahahahaha–thanks Sheila! Love puns. Laughed out loud! Absolutely delightful read, Maria! I hope that at some point I’ll discover my own Mrs. Magoo aspect–I could certainly use her! Thanks for making my day more cheerful. Wow, you left yourself a present, which became a surprise because you forgot about it! I had been thinking about your post Elegy for the Blackberry Bramble as I read this–even before you mentioned the post. It’s one of my favorites you’ve written. This one is also one of my favorites. The need for growing things is so strong in the spring… it’s a beautiful and yet an almost unsettling feeing. Haha, love it!! Mrs. Magoo sure knows how to live. 🙂 The little surprises you forget about are always so wonderful. Mark and I are starting our own little garden this weekend! We finally have all our raised veggie beds built (although no covers yet – hopefully we can get those done before everything is eaten by squirrels and deer and mice and raccoons and whatever else we have living here). So very excited to have a nice, sunny spot for growing magical things! What a charming post, Maria. I love the idea that you gave yourself something you wanted without even realizing you had done it! And there’s something profound in there — it wouldn’t have been such a gift if you’d planned it and then collected it all along, but because you forgot and were surprised, it *was* a tremendous gift. Anyway, Mrs. Magoo is certainly worth keeping around in Portland 🙂 Glad you are settling into your new home with plenty of curiosity and surprises. Hi Maria, I totally relate to your “52 pickup” experience! In fact, it’s why I avoid moving like the plague—the re-learning of muscle memory so I open the right cabinet door to get out my coffee cup first thing in the morning, mapping out a new grocery store in my head, etc., etc. Next move, I’ll try channeling my own “Mrs. Magoo”! I bet that’ll make it a lot more pleasant. More importantly, though, I LOVE your guerilla gardening tactics! I couldn’t help but smile thinking of you stealthily planting veggie seeds in your neighbor’s planter. And the onions? Lol! Who was that awesome woman who thought to plant onions? Oh wait… 😉 Brought a smile to my face on a Monday morning!